Tyrone and Dublin meet on Sunday afternoon in the 2018 All Ireland final. Ahead of the season's big game, Declan Bogue casts his eye over the teams. Niall Morgan 8: Despite the wobble of a kickout that cost them a goal against Donegal, his performances have been better than ever in the bread and butter duties. Michael McKernan 8: Excelled against Paul Mannion in Omagh, holding him scoreless while getting upfield to score himself. Expect to see that match-up again. Magnificent against Ryan McAnespie in the semi-final. Ronan McNamee 7: Tracked Ciaran Kilkenny in the Super 8s game in Omagh but more likely to pick up Dean Rock here. Hasn’t been commanding but adds an occasional attacking threat by joining moves late. Padraig Hampsey 8: Impressive in some games, such as the semi-final and his work against Conor McManus, but the Dublin game passed him by. Could be on Ciaran Kilkenny for this — a massive undertaking. Tiernan McCann 8: He is in All-Star territory but his levels are slightly tempered by having to come back from a bad injury during the league and prior to Championship. Could end up tagging Jack McCaffrey for spells. Frank Burns 7: Just as he was establishing himself as a free-roving centre-back he was pushed up against Monaghan. Performances have tailed off as the summer has got longer but very capable. Peter Harte 8: For Tyrone to win, they require Peter Harte to be in the game from the first five minutes. Has been bottled up regularly by marker John Small in previous encounters and needs to address that. Colm Cavanagh 9: Injured for the first game against Monaghan, the Moy man has hit top form since the start of the Super 8s and his tackle on Jack McCarron to close the door on Monaghan was incredible. Cathal McShane 8: Rescued Tyrone's season with that late point against Meath, but robbed of a goal chance against Dublin by Paul Mannion's covering tackle. Huge job ahead of him trying to curtail Brian Fenton. Mattie Donnelly (C) 8: Another man who has happily found form at the right time, he needs to at least dominate James McCarthy in terms of loose ball and contribute a score or two at important times. Niall Sludden 9: Will be determined to shake off Eoin Murchan unlike in Omagh and maintain semi-final form and point-kicking abilities. His kick-passing to the inside line will be of utmost importance here. Kieran McGeary 8: A throwback in a sense that he shows opponents no respect at all, brilliant at getting beyond the first line of defence and was their most influential player against Donegal. Mark Bradley 8: His inclusion is a statement of intent that Tyrone intend to go after this game and not just hunker in for a defensive hold-out. Bright and inventive, performed well in Omagh. Richie Donnelly 7: Although he has the physical gifts, has not been used as a traditional full-forward. Needs to stay close to goal and not allow Philly McMahon to win this individual tussle. 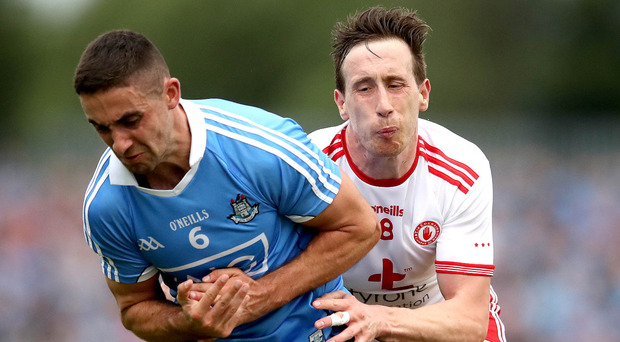 Connor McAliskey 7: Tyrone's free-taker has not the accuracy of Dublin's Dean Rock and has had difficulty finishing in big games in Croke Park. He will not lack for full-blooded effort. Stephen Cluxton 7: Possibly the most influential Gaelic footballer of the 21st Century, to the point where he has influenced the game itself as opposed to games. Has been poor under the high ball this year, though. Eoin Murchan 8: Picked to mark Ryan McHugh against Donegal and Niall Sludden against Tyrone, a prized recent asset, his small stature seen as a positive in a tall defence. Jonny Cooper 8: Still the bravest defender Dublin have, and usually their top performer, but vulnerable under the high ball. Some day a referee will also deal with the nature of his tackling. Philly McMahon 7: Will be expected to pick up Richie Donnelly and win that battle. His aggression levels are perfect for an All-Ireland final when referees are more lenient, and will put Tyrone on the back foot. John Small 7: His role will be simple — stop Peter Harte by fair means or foul. Over the last couple of meetings, that line has been blurred. An early card could be hugely significant. Cian O'Sullivan 8: Will be second man in for the tackle if a Tyrone player wins possession in the inside line, but generally he is the sweeper and a bright organiser at the back of a sound defence. Jack McCaffrey 9: Still has that frightening pace even after coming back from a ruptured cruciate in the early stages of last year’s final. That quality is used and relied upon to break down defences such as Tyrone’s. Brian Fenton 9: Still unbeaten in his Championship career, is already the main man in the Dublin engine room. Will play a huge role when Tyrone push up on the Dublin kick-outs. James McCarthy 9: A complete Rolls-Royce of a player and someone who will punch holes in the Tyrone defence with his pace, persistence and his ball control. Scored the Dublin goal in Omagh utilising those qualities. Brian Howard 9: Supremely athletic, he is a talented ball winner who can kick scores from distance, and hard as it is to believe, is an upgrade on Paul Flynn whose place he has nailed down as his own. Ciaran Kilkenny 9: Dublin’s conductor of the attack has to be targeted by Tyrone. In the earlier league meeting between the two, he drifted into the inside forward line and scored 1-2. Might happen again. Niall Scully 7: Perhaps the least flashy of all the Dublin forwards, he is a worker bee who does a serious bit of work off the ball, pulling defences out of shape. Has shown he can finish too. Paul Mannion 8: I give him an 8 but every single day he threatens to be a 10. Did not score last day against Tyrone but prevented a goal-scoring chance. Tackling is incredible for an attacker. Dean Rock 8: Every team would adore having a free-taker as reliable as Rock, who clinched last year’s final from the dead ball despite having a GPS tracker flung across his eyeline. Con O'Callaghan 7: You could hardly blame him for the slump he has had this season, given his playing schedule over the last few years. Definitely given a more blue-collar role this summer.